As a genre, RPGs are generally known for epic adventures couched in complicated mechanics and skill trees, and for being set in large worlds for players to explore. 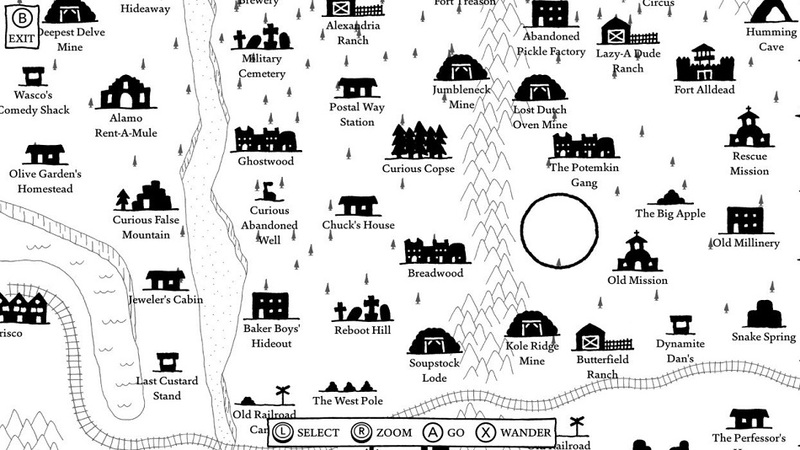 West of Loathing doesn’t offer the same things on a similar scale, but its density, humor, and accessibility mean that it’s an equally epic experience just as enjoyable as any high fantasy adventure, just in a different sort of way. 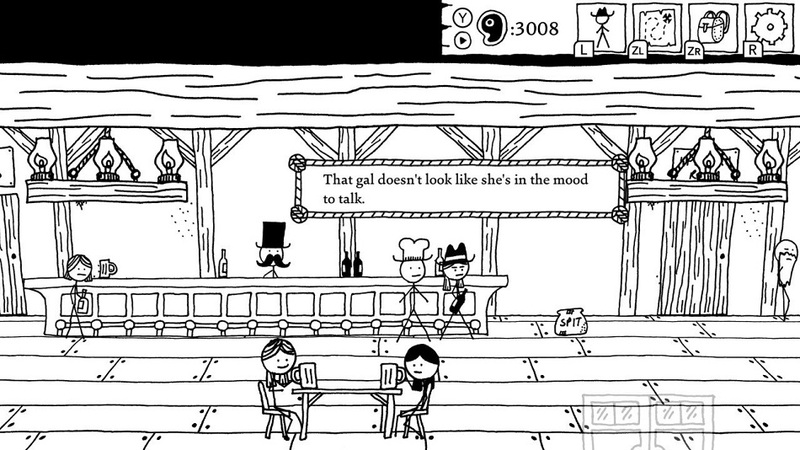 Asymmetric’s West of Loathing is a 2D turn-based RPG set in the wild west. Players will create a character and to go out into the word to explore and find their fortune, coming across snake-infested mines, jellybean museums, graveyards, pickle factories, and the most dangerous creature known to man — cows. First things first, the writing here is astonishingly good. Nearly everything has some type of joke attached to it, and humor is saturated throughout every encounter and item. I was laughing the entire time while playing — things like sticking a newspaper to a cactus’ face so he can read it, plating a turnip in silver as a crown, or checking out spittoons all had me giggling. A similar level of attention is paid to characters. Potential party members have depth, like Doc Alice who drinks to try and forget how her dead patients started coming back to life, or Susie Cochrane and her vendetta against the cows that destroyed her ranch and killed her family. It’s all so deep, in fact, that players won’t be able to explore everything in one playthrough. WoL‘s world is a vast number of small locations scattered across an overworld, and it allows players to go to any area they’ve discovered in any order. As such, it’s possible to lock off some story beats without meaning to or even realizing it’s possible. For example, the player can’t immediately talk to one of the possible partners. If they don’t find the book that teaches its language, the only option is to fight and kill them, never to be revived. 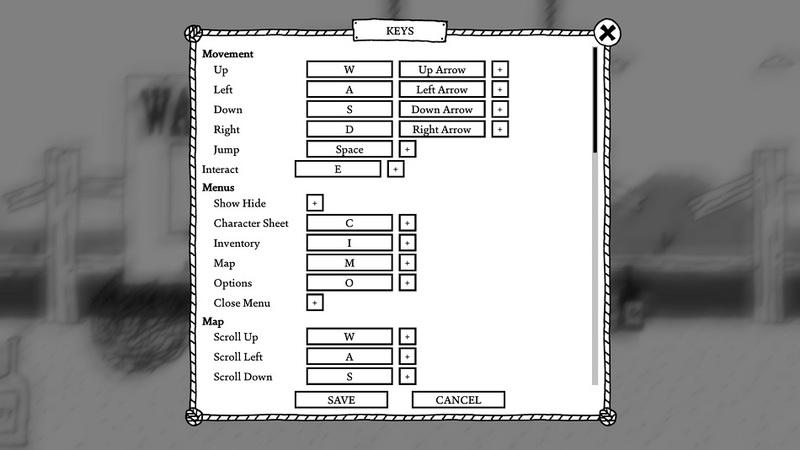 In the turn-based combat, skills and items will determine the player’s stats in the categories of muscle, moxie, and mysticality. Players also have action points to utilize special abilities like a triple-shot attack or summoning a minion to the fight. 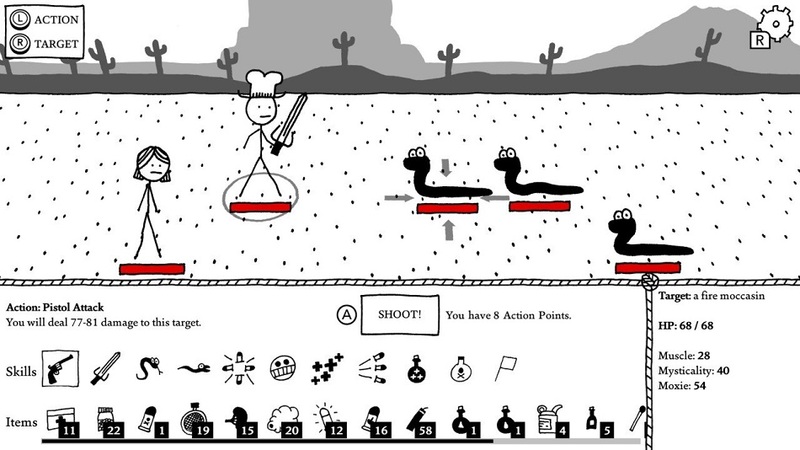 It’s fairly basic in implementation, but perfect for this game since West of Loathing puts the emphasis on giving the characters life and telling humorous stories than worrying about making combat overly complicated. In addition to endless jokes and appropriate combat, it also offers puzzle solving and critical thinking, and the brand new DLC, Reckoning at Gun Manor, is a fantastic example. The stage opens at Gun Manor, home of Teresa Gun, and when players arrive it’s clear that something isn’t quite right. Florence, a local specter hunter, tells you she’s tasked with clearing out all the ghosts in the mansion, and the house itself is a series of interconnected puzzles, slowly revealing the truth about what happened to the residents. It’s a great mystery to solve, and like the core content, had me in stitches the entire time. In a meta sense, one of WoL‘s finest aspects is how dense and compact it is. There’s a lot to explore, but there’s never a grind for experience since there are plenty of places where players can kill infinitely-spawning enemies, but clever use of items can also get players around challenges if they don’t want more combat. The main quest can easily be finished in ten hours it someone sticks to the critical path, but I wanted to see everything and I’m guessing other players will too. Disclosures: This game is developed and published by Asymmetric. It is currently available on PC and Switch. This copy of the game was obtained via publisher and reviewed on the PC. Approximately 15 hours of play were devoted to the single-player mode, and the game was completed, including DLC. There are no multiplayer modes. Parents: According to the ESRB, this game is rated T. The game has alcohol and hints at drug use (ex: magical mushrooms). There is violence in shooting or stabbing cows, skeletons, snakes, and bandits. Having said that, it’s stick-people drawings, there’s nothing gory. I may not let the very young play, but young teens and up are just fine. Colorblind Modes: There is a colorblind mode available in the options… for reasons that don’t quite make sense for a black and white game. Deaf & Hard of Hearing Gamers: All information is text based, however text is not resizable. There is one side quest which would require sound, but the game is fully accessible otherwise. Remappable Controls: Controls are Fully remappable on PC. I love how Asymmetric incorporate doodle arts in their video games. 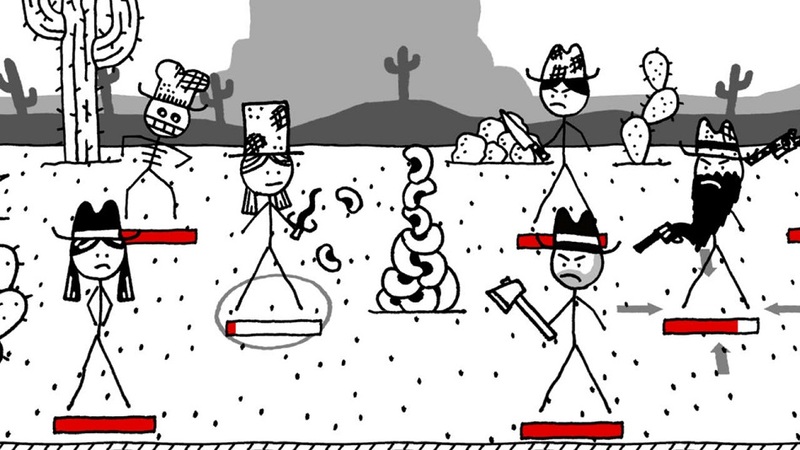 Their hand-drawn stick figure turn-based browser RPG Kingdom of Loathing was well-received back in 2003. I’m not surprised that West Of Loathing would end up the same. Fantastic review for a fantastic game!